How Can You Support Haytap Projects in The New Year? Help Stray Animals by Buying Chocolate from Haytap! HAYTAP Once Again Saved Many Cats and Dogs from the Cruel Pet Shop Trade! Why is it necessary to microchip animals? (*) Come on, my love, you can do it ! (*) HAYTAP is against gigantic shelters such as Istanbul Kısırkaya ! (*) SAY “NO” TO ZOOS , AS WELL ! Whom Do You Serve, My Brother? (*) Istanbul : What Kind Of City We Want ? I Clicked, I Clacked, And Thus I Protected Animal Rights! What did HAYTAP do in 2008? (*)There is no Nationalism in Defending Animal Rights! How long torturing animals will continue to be aceepted merely as a misdemeanaur instead of crime ? 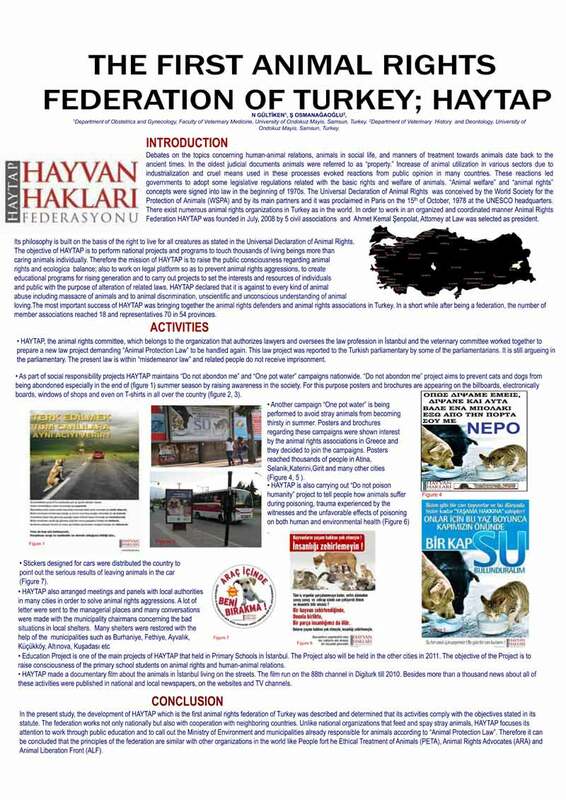 HAYTAP ANIMAL RIGHTS FEDERATION is the first federation of Turkey , gathering all associations having the same opinion on this issue for the protection of the nature, the environment and the animal rights. In order to raise awareness among the people on the violation of the rights of nature in which we are living and animals, to avoid the violations, our Federation open trials at the courts as much as it can with its power, participates to the training activities, performs the public relations and interviews necessary to change the relating laws and to better apply the laws. The first federation of the rights of the Animal of Turkey was created on July 9th, 2008 upon the decision of 5 Non-governmental Organization defenders of the rights of animals far from being a classic associative approach working in diverse provinces in Turkey to become a single heart. 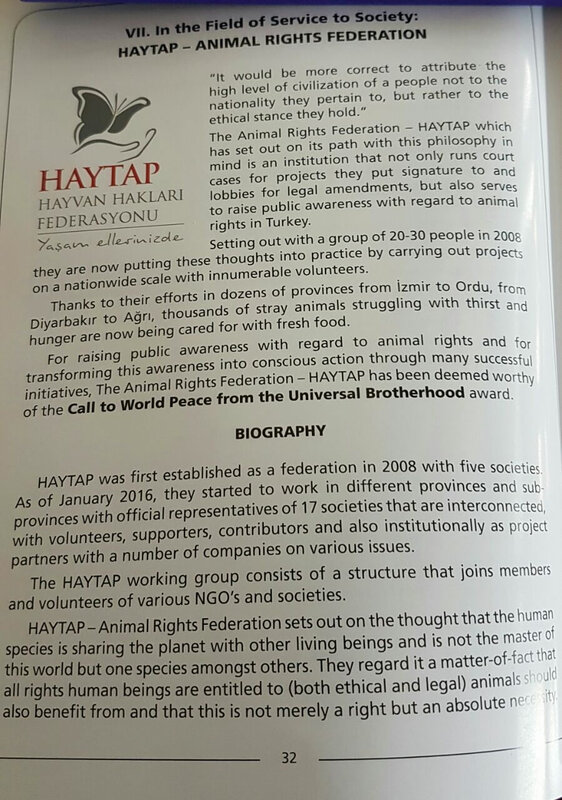 The Animal Rights Federation HAYTAP, has a different structure comparing to the point of view established to has present in particular by providing services of public relation, training, law, interviews with competent authorities, seminars on the rights of animals for its members and animal - lovers making parts of its objectives to fight against the violations of the rights of animals and the protection of the stray animals. Our Animal Rights Federation organizes these meetings all year round in various cities in populated places without any ideological pressure under a powerful unique voice at the national level with the aim of gathering all the defenders of the animal rights which are conscious and which have a scientific approach under a single powerful voice. To allow reorganization at the national level in a near future, HAYTAP plans to attribute offices of representation in 40 provinces working with same principles and to gather approximately 20 associations and foundations and to create a powerful unique voice. At the same time HAYTAP, plans to train all its members and supporters who believe has this sacred cause and to transform them into defenders conscious about the rights of animals. 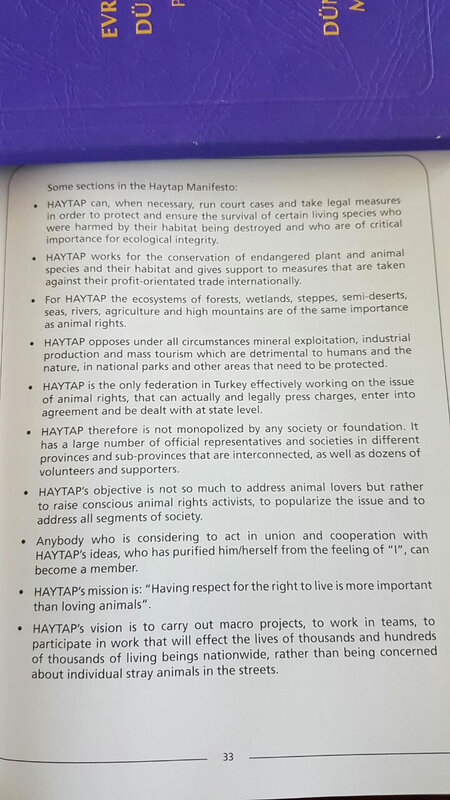 HAYTAP has the ambition to become a non-governmental organization which emphasizes the importance of the works of the public relations and the solidarity between the defenders of the rights of animals so that the rights of animals can be well understood in Turkey. The essential philosophy of HAYTAP bases itself on the right of life of all the human beings. Whether they are animal stray or animal owned, all the animals have the same right of life as the human race and as it is proclaimed in the Universal Declaration of Animal Rights, the right of existence is a natural law acquired by all the animals of their birth. HAYTAP is against any act of destruction, torture, massacre, animal trademarking made against the human beings and the nature, the acquisition gain obtained with these animals and even against any approach of animal - loving which is not scientific and unconscious. To resolve the problems HAYTAP try absolutely the way of communication and conciliation . When it considers that it can obtain nothing by this means, it does not hesitate has to resort to the legal procedures. For HAYTAP the main part is not to criticize or to lodge a complaint but to make propositions” and to make the follow-up of these propositions. Not only it would be of no utility to make propositions and not to follow them but it would also be a waste of time for everybody. None of the persons working within HAYTAP as volunteer proposes projects in which she could not take part for their developments. There is necessarily an adequate mission for all those who like HAYTAP and who would like to take part in the activities of this last one. The essential is not to take part partially in this fight in a daily way but to produce and to apply projects of the beginning till the end within the framework of this team and the team spirit. 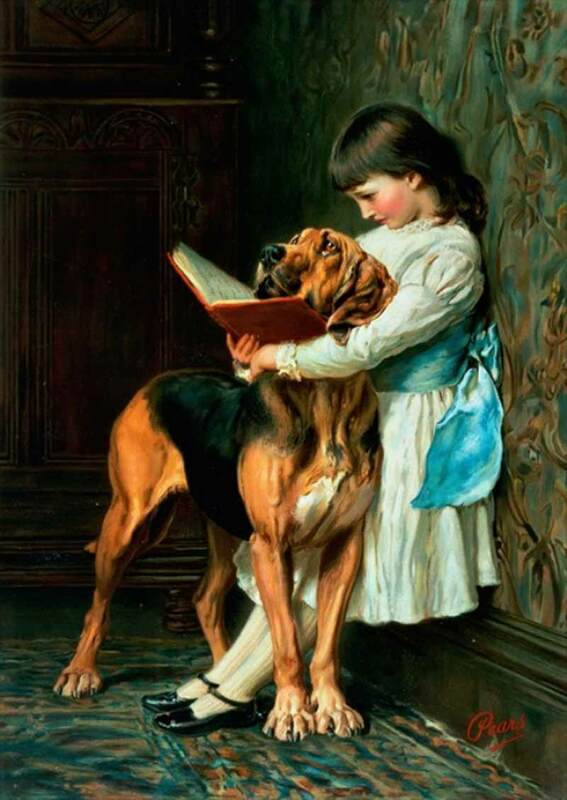 The affection for animals in itself is not sufficient to be in teamwork. The respect in the right of existence is more important than the affection for animals. HAYTAP is not absolutely a portal of news. An educational institution while showing to the volunteers the roads which they needs to follow and or are shared the success as well as the works of follow-up led within the framework of the violations of the rights of the Animal. The Web site which follows at present is the official site of Our Federation of the rights of the Animal with the acronym HAYTAP, it is on no account a portal of news or an institution of denunciation. On this web site we share the works performed by our Federation, the purpose being to establish a place of follow-up of these works for everybody looking forward to the increase of participation. As it is well known, the natural living environments are being broken due to the sterile political point of view in which we are and due to the fact that the entire world is putting in the first place the economic interest for each concrete event. HAYTAP exists in order to be in the center of the politics aiming to avoid the loss of natural living environments and the disappearance of these environments. When it is considered necessary, in order to enable some living species harmed by the disappearance of their living environments and having a critical importance for the ecologic integrity to survive and continue their existence, the Federation opens trials and proceed to the legal means. For HAYTAP, as much as the rights of the animal, the ecosystems of bits, wet zones, fields, seas, meadows, zones at the middle desert, rivers, agriculture have the same importance. It is positioning at an equal distance to each. The nature does not solely mean the green and the forest. For the HAYTAP team, all the ecosystems having each one their own living tissue are important. It believes in the education and the fight for the ecological relations among these ecosystems and the protection of the living species against any harm. It supports all the activities towards the protection of the natural environments important for the living kinds and the cultures, the restoration and the enlargement of the environments if damaged by the effect of human being. One of the most important missions of HAYTAP is the work performed to increase the part of the budget allocated from the State Budget for the protection of the nature and the betterment of the natural environments damaged; it works so that the assigned money is spent in good places. It is encouraging the public institutions to spend Money for these aims. It does not collect money from volunteers’ fort he works that could be done by the State; it tries to execute the supervision and warning duties of the non-governmental organization. nd civilian platforms fort he protection of the nature and organizes local and global campaigns. It leads serious efforts and makes pressure on public authorities for the establishment of a legal and institutional infrastructure and necessary new co operations to sign and apply the international conventions towards the protection of the nature. It has an active role in the works of Lobbying. The Animal Rights Federation HAYTAP, starting from the point that the human being is sharing the planet with other living species, believes that the human being is not the master of the world and that it is a specie among others. It considers natural to enable the animals to benefit from the same rights as the rights provided to human kind (morally and legally) and it believes that beyond a right it is a necessity. HAYTAP, is absolutely against people who enlarge their own living environment against their neighbors with whom they are sharing the planet, who occupies the living environment of their neighbors and who act with cruelty against their partners with whom they are sharing the cities. Especially on this issue our Federation supports the living of the stray animals with whom we are sharing the life in the cities with the human being, their freely roaming in the streets with the condition to keep their number at a tolerable level and if necessary by vaccinating them. HAYTAP is defending the fact that animals cannot be subject to experiments. It is against raising animals for their furs, selling them in the pet shops, hunting them, making them a trade good. It is against doing sport hunting and massacre that could lead to the disappearing of their species, it is against capturing them, making them live under captivity, using them as subject in shows without their own willingness and any kind of bad treatment for any reason. For this reason, the Federation uses efficient correspondence methods and legal means and when necessary ensures a first hand and correct reflection of the news by making cooperation with the media. In the same time HAYTAP is defending the avoiding of illegal animal trade, the respect of international conventions including the protection of species and the elimination of existing pet shops. It is defending the idea that the animals which are not able to Express themselves should be ethical and legal subjects like human beings; it is aiming to prepare the population by accepting the fact that animals would be able to sue on their own behalf and be included in the legal prosecution is a long term objective. HAYTAP is convinced that the unequal relation existing nowadays between the human being and the animals has started with the domestication. It is aware of the fact that a moral approach that would end the dependency of animals to human being should be developed for an ecological population aimed to be established in the future.